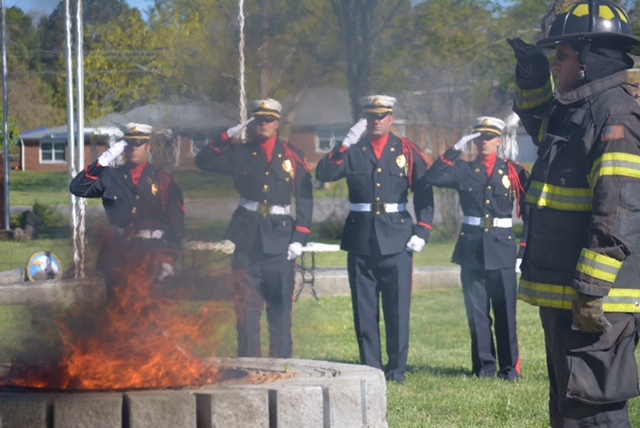 The ceremony to respectfully retire worn and faded American flags was conducted by the Cleveland Fire Department Honor Guard. More than 50 flags were properly disposed of during the ceremony. At least that many more have been collected for a future ceremony. Most people are unfamiliar with the proper way to dispose of a tattered and worn American flag. So the CFD started a drop-off service in October, 2015 at Station 5 on Freewill Road and now at Station 4 on Keith Street also. The ceremony will be conducted on a regular basis with number of flags determining the frequency of the ceremonies. With the flags properly folded Saturday, the CFD Honor Guard stood at attention. On command, the first faded Old Glory was ceremoniously escorted to the burn pit and saluted. Spectators and attending firefighters were then invited to bring one of the collected flags forward. When each flag had been honored and disposed of, firefighters buried the ashes, as protocol requires. The burial was on the VFW grounds. The CFD Honor Guard, commanded by Zach Reagan, currently has 16 members representing each Fire Department battalion. They practice each month. The Honor Guard takes part in public ceremonies, funerals for fallen and retired firefighters and other events. They also participate with smaller departments that do not have honor guards.